Our camp is located north of the Quetico Provincial Park in northwestern Ontario. 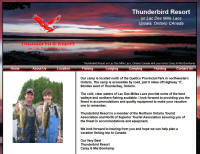 The camp is accessible by road, just 6 miles off Highway 17, 90 miles west of Thunder Bay, Ontario. The cold, clear waters of Lac Des Milles Lacs provide some of the best walleye and northern fishing available. Thunderbird is also equipped to accommodate the hunter. We have had excellent hunting for fall bear, ducks and moose.